Famously known as the land of legends, Nelakondapalli in Khammam district abounds in heritage spots. If you love exploring the ruins and nostalgia, you got to grab your keys and leave. It is often said that the heritage spots of Nelakondapalli date back to the times of Mahabharata. Full of viharas, wells, cisterns, and stupas, this town will quench your thirst for curiosity. 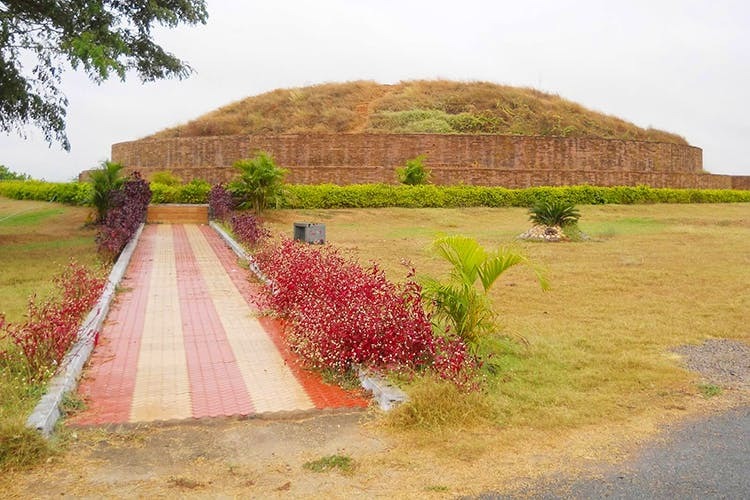 With a mud fortification wall and a Mahastupa that has been excavated by the Archaeology department, Nelakondapalli is a dream for history buffs. The Buddhist stupa carved out of limestone, is from 3rd and 4th centuries, and we think this is a reason good enough to get here. Plenty of ancient temples are in and around the town that you can add to your itinerary. Plus, don't miss out on the local handicrafts! We recommend a day trip to this place, and an overnight stay in Khammam as you won't really find any stays or restaurants in the town. Although this is a less-discovered spot, it lacks proper facilities for overnight stays and food for travellers to truly explore the town for more than a day.